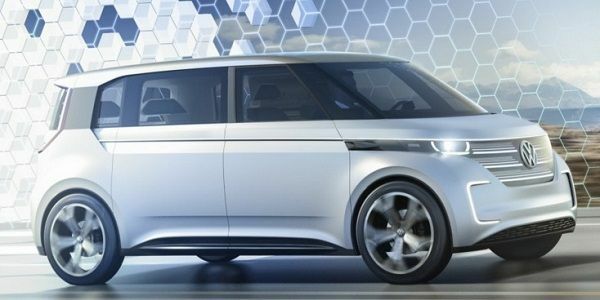 Volkswagen hopes America will forgive the company for the emission scandal and unveils a Budd-e concept, which is an eco-friendly Microbus and looks like the bigger cousin of Kia Soul. Unfortunately someone just leaving the event said they were disappointed to hear 'end of decade' delivery! Ugh. I was hoping for 2017. Hope VW is still in business by then in that case, they're going to lose a lot of money fast and I think EVs are their only chance to break into a new fast growing market. Oh well, more space for Kia to innovate. Concept means never happening in my book. Tesla spoils us. Nissan and Kia have committed to have self driving cars by 2030 when Tesla cars already have it. It reinforced how slow to adapt these companies are; how obsolete and inflexible they've all become. Agreed, until the auto makers understand that we wanted this tech yesterday which means producing tomorrow - they'll do poorly. I think it's interesting because BMW has done such a great job with the i3 that 40%+ are new customers to BMW, never owned one before... so the companies that court gen X and millennials first will have a huge advantage. David Herron, who used to contribute to TorqueNews regularly, writes: "Concept" doesn't always mean "not happening." The Bolt was unveiled as a Concept last year, and is now shown as the production vehicle. I examined the car in person last night and it looks great. Some version of this car is going into production around mid-2019. Thus, in my opinion by the end of the decade we will see very interesting developments and promises delivered in the electric car market. End of decade. That is a big disappointment. For VW that is too little to late. .By then GM and Nissan and many others will have BEVs that will out range this car. Nothing wrong with the car, it needs to be on sale this year.